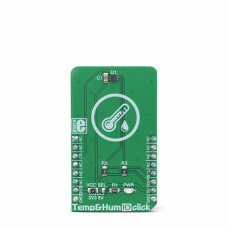 Temp-Log 5 click is a temperature measuring Click board™ featuring the CAT34TS02, an accurate temperature sensor IC with integrated Serial Presence Detect EEPROM. 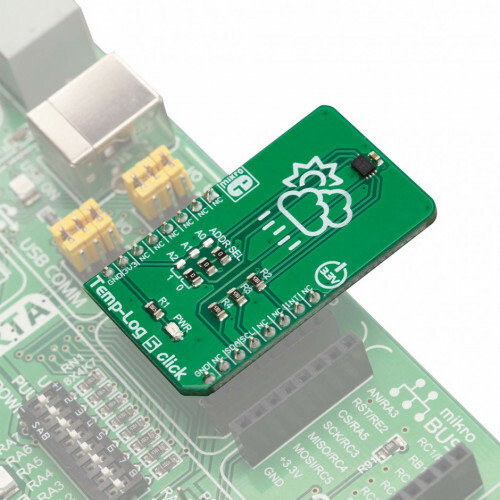 Temperature Sensor measures and store temperatures at least 10 times in second. Temperature measurement results can be retrieved by the host MCU via I2C interface, and are compared to critical limits stored into internal registers. It also features programmable event output function and supports three modes. Temp-log 5 click is supported by a mikroSDK compliant library, which includes functions that simplify software development. This Click board™ comes as a fully tested product, ready to be used on a system equipped with the mikroBUS™ socket. 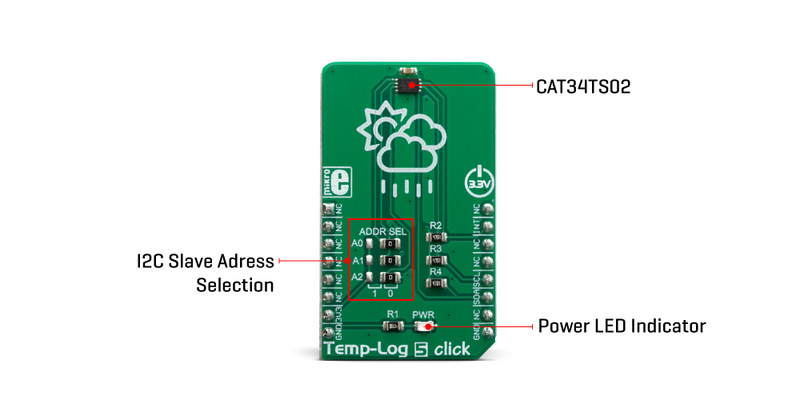 The sensor IC used on the Temp-Log 5 click is CAT34TS02 from ON semiconductor that combines a JC42.4 compliant Temperature Sensor (TS) with 2 Kb of Serial Presence Detect (SPD) EEPROM. 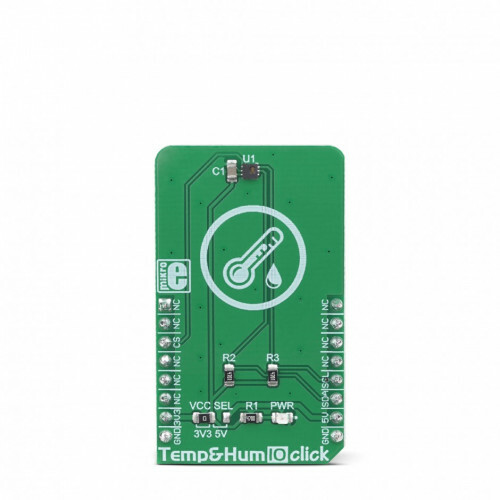 Temperature sensor measures and stores temperatures at least 10 times in second, allowing it to be retrieved by the host MCU via the I2C interface. The result can be compared to critical limits, stored into internal registers. This allows the sensor to reduce the processing workload of the host MCU by employing the trigger limits mechanism: by asserting the EVENT line to a LOW logic level, the CAT34TS02 is able to wake up the host MCU, reducing the power consumption. The EVENT pin is routed to the INT pin of the mikroBUS™. The CAT34TS02 IC can be configured to trigger an EVENT in three different modes: Interrupt mode, Comparator mode, and Critical Temperature mode. When set in the Interrupt Mode, the EVENT output will be asserted every time the temperature crosses one of the alarm limits. Once the temperature exceeds the critical limit, the EVENT remains asserted as long as the temperature stays above the critical limit. The EVENT can be cleared by setting a bit in a corresponding register (must be cleared by the software). However the pin will remain asserted as long as the temperature exceeds the critical limits. In the Comparator mode, the EVENT pin is asserted whenever the temperature is outside the predefined limit values, and deasserted as soon as the temperature drops under the limit (no need to clear the bit by the software). If set in the Critical Temperature Mode, the EVENT pin will be asserted only if the temperature exceeds a critical threshold limit. The limit values can be programmed via the corresponding registers. 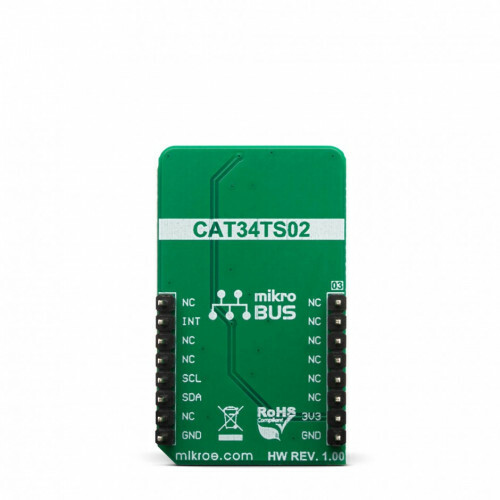 CAT34TS02 IC uses the I2C/SMBus protocols to communicate with the host MCU. Its I2C bus pins are routed to the mikroBUS™ I2C pins and are pulled to a HIGH logic level by the onboard resistors. The I2C slave address of the CAT34TS02 IC can be selected by ADDR pins A0, A1 and A2: LOW logic level clears the corresponding address bit (GND), while HIGH logic level sets the bit (VCC). This can be done using a group of onboard jumpers, positioned under the label ADDR SEL. The provided click board™ library contains simple and easy to use functions, which simplify configuring and reading of the measurement data. These functions are demonstrated in the included example application and can be used as a reference for custom projects. These functions can be used in mikroC, mikroBasic and mikroPascal compilers for all MCU architectures, supported by MikroElektronika. 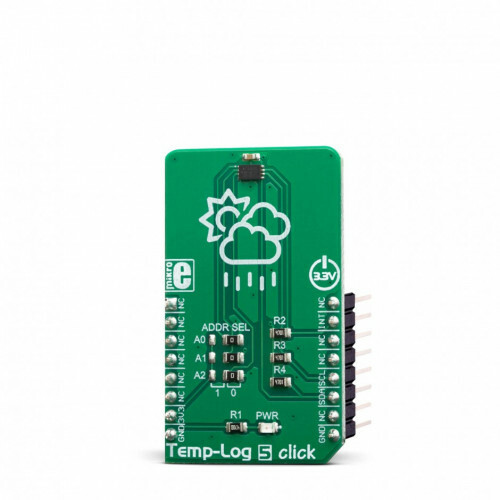 Applications Temp-Log 5 is a great solution for the development of various embedded applications based on temperature measurement and data logging. This table shows how the pinout on Temp-Log 5 click corresponds to the pinout on the mikroBUS™ socket (the latter shown in the two middle columns). We provide a library for the Temp-Log 5 click on our LibStock page, as well as a demo application (example), developed using MikroElektronika compilers. The demo can run on all the main MikroElektronika development boards. The library initializes and defines the I2C bus driver and drivers that offer a choice for writing data in TS register and read data form TS register. The library contains function for reading Temperature data, functions for writing and reading EEPROM, functions for reading Interrupt status and temperature status. The library provides full control of all the registers that the modules contain. System Initialization - Initialization I2C module and set INT pin as INPUT. Application Initialization - Initializes driver init, Test comunication, EEPROM write/read test and configuration device for measurement. Application Task - Reads Temperature data and logs data to the USBUART every 1 sec.